Led fashion design and good quality. 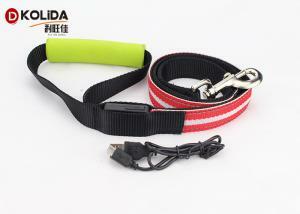 Excellent dog leash for training or walking. Walking, running and having fun with your dog. 65Mah battery, rechargable about 1 hours, using time is about 2 hours. 90% of our product is private mold unique designed and we will issue new product each month continually. We supply after service if you have any question. Q1. Are you a manufacture ? A: Yes, we are a manufacture, we have factory in shenzhen. Q2. Does your collar are real nylon ? A: Yes, we use nature nylon with eco-friendly material. Q3. Does your other material are eco-firendly ? A: Yes, we adopt all materials are eco-friendly including nylon, silicon, led, and PCB plate are all nature material. Q4. Do you supply free samples? A: Yes, we supply free samples, just need you bear the sipping fee. Q6. Do you have any MOQ limit for led dog collar order? A: Low MOQ, 100 pcs is ok.
Q4. How do you ship the goods and how long does it take to arrive for samples? Q5. How to proceed an order for led dog collar? A: Firstly let us know your requirements or application.Secondly We quote according to your requirements or our suggestions.Thirdly customer confirms the samples and pay deposit for formal order.Fourthly We arrange the production. Q6. Is it OK to print my logo on led dog collar? A: Yes. there are 2 LOGO printed way. One is printed on the collar and the other way is by sewing weaved lable on the collar with your LOGO. A: Firstly, Our products are produced in strict quality control system and the defective rate will be less than 0.2%.If the defective product is our factory responsibility we confirmed, we will supply the faulty quantities in the next order. Our QC staff members check all raw materials and every finished product. So each item you order from us is inspected to meet your requirements. Our Factory located in Jinchi No.3 Industry Area, Bao An District, Shenzhen, Guangdong Province, China. Nearly to shenzhen airport, just 30 minitus to our factory. We have 3 product lines, main product including 5 series: the Blinker, Lead, Outdoor, Toy and Promotional series. Department etc. Total 100 skillful employees, with which furnished with high efficient equipment, such as, automatic sewing machine, laser machine and ultrasonic welding machine, etc. In 2009, we got ISO9000 international quality management system certificate. Also, Kolida Technology owns a professional R&D team, and gets the CE/ROHS/GS/UL/ FCC approval, Our products enjoy a good reputation in dealers depend on its good quality, reasonable price and best service. Our mainly market is the whole domestic market, Southeast Asia, Middle East, Europe, USA, South America, Asia etc. Kolida devoted in researching and producing products more suitable and comfortable for pets, put the idea of promoting pets life as enterprise mission. Under the idea of “love kolida, love pet,” advocating to enjoying happy during loving your pet is the indispensable spirits value, to supply happy for everyone who loves pet.